SINGAPORE, JUNE 1, 2015 - Unified Inbox launches the Weibo social network on its Outbox Pro social publishing tool. Singapore-based Unified Communications (UCaaS) company Unified Inbox (UIB) has launched a new addition to its easy-to-use social publishing and management tool Outbox Pro. Driven by the interest shown by resellers and telecom providers in the Asian region, (Sina) Weibo has been added to the growing suite of prominent social networks supported by Outbox Pro. Previously, Facebook, Twitter, LinkedIn, and Xing were the four social networks available on the tool. Weibo has achieved impressive growth in the Asian region, with monthly active users reported to be 175.7 million for the month of December 2014, an increase of 36 percent year over year. The daily active users were reported to be 80 million on average in December 2014. With such high usage, marketers use Weibo for their consumer campaigns. Advertising and marketing revenues of Weibo reportedly grew 78 percent year over year to US$265 million at the end of last year. Weibo consumers include Asian celebrities, movie stars, singers, media figures, athletes, artists, brands, government departments, sports teams, and consumers from Hong Kong, Mainland China, Malaysia, Taiwan, and Macau. Among the non-Chinese-speaking celebrities that use Weibo are the German national football team and the Indian Prime Minister. Translated literally, Weibo means “microblog” in Chinese. When compared to two of the dominant U.S. social networks, in terms of functionality and usage, Weibo is seen as a mix between Twitter and Facebook. While most aspects work in similar ways, there are some interesting optimizations that brands need to make before posting. For instance, like exclamation marks in Spanish and unlike on other social networks, a hashtag on Weibo needs to be at the end of a word as well as the beginning (e.g., #hashtag#). The Weibo system offers multiple levels of verifications, for instance a blue V for brands and an orange V for consumers. These small variations are often necessary to be implemented into a social media strategy for brands with presence over several different social media networks. Through the Weibo integration, Outbox Pro users will be able to incorporate posting of text and media content on Weibo through Outbox Pro’s easy-to-use approval and optimization process. Outbox Pro is a Google Chrome web browser extension and is free to download from the Google Chrome Web Store at http://uib.li/opdirectstore. The first 100 posts are free. Additional posts can be purchased at 25 cents US each. For users who would rather pay by the month (or year), Outbox Pro costs US$9.00 per month (US$99.00 per year) with unlimited posts on unlimited – including all future – social networks. Competitive enterprise pricing plans are also available for companies of all sizes. 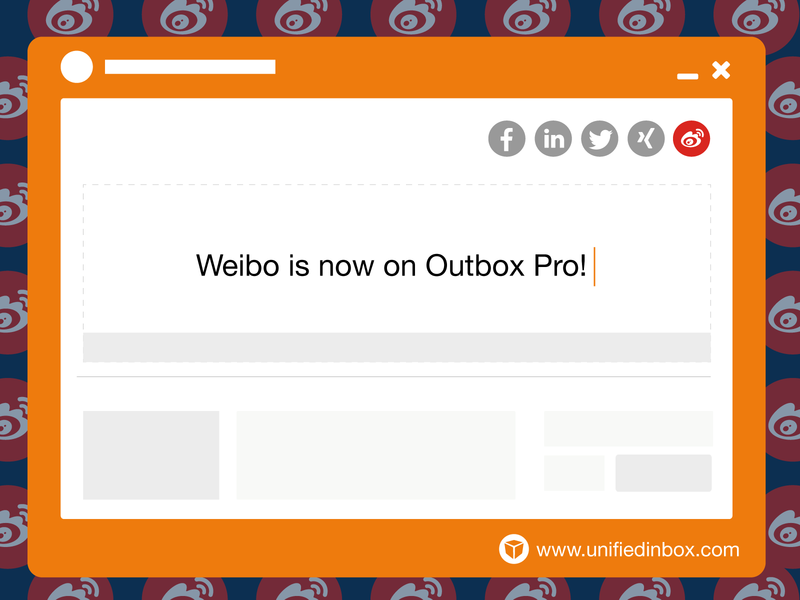 The Weibo integration with Unified Inbox’s social publishing tool Outbox Pro will be showcased during the CommunicAsia 2015 event in Singapore June 2-5, 2015. To learn more about Unified Inbox and Outbox Pro, please visit http://unifiedinbox.com and http://outbox.pro.